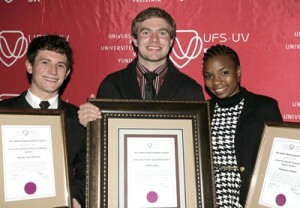 Among Kovsies’ brightest young stars. From the left are: Jean Vermaas, Johann Steyn and Onthathile Serehete. The most talented students of the Bloemfontein Campus have been announced. Johann Steyn, a final-year LLB student and SRC member, was named as the SRC Dux Student for 2013. He and seven other students were recognised for their academic achievement and participation in extracurricular activities. Jean Vermaas, also a final-year LLB student, and Onthathile Serehete, a fifth-year medical student, were announced first and second runner-up respectively. In a new category introduced this year, Jomari de Beer, Mpho Sefo, Lehlohonolo Mofokeng, Richard Chemaly and Foster Lubbe received student achiever awards based on exceptional achievement, representing the university in renowned organisations or structures. The SRC Dux Student Award is granted to a final-year undergraduate student who has demonstrated excellence in academic achievement, co-curricular and community involvement, and student leadership.